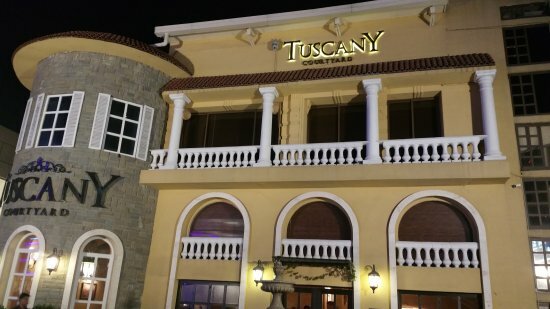 Tuscany Courtyard is one of the finest Italian restaurants located on MM Alam Road, Lahore. Tuscany is the name which was given by the owners after their trip to Tuscany, a small village in Italy. Inspired by freshly baked, thin crust pizza and other Italian delicacies, the trio decided to open a place which would serve authentic Italian food instead of the regular desi/continental food most restaurants in Pakistan serve. They have completely original Italian recipes, with a wide variety ranging from two tomato bruschettas to thin crust, specialty pizzas. The special dishes to look forward to are Wild Shiitake Mushroom Steak, Hot fudge skillet brownie, Bread and Butter pudding, Thai fiery Chicken, Tuscany special Pizza (Staggioni), Mushroom Melt Burger and Avocado & Shrimp Salad. And a must try should be their signature dishes the Grilled chicken with Jalapeno sauce and Polo Tuscan. For the desserts, hot fudge skillet brownie and bread & butter pudding would be a must order. Service, as always, is superb and while the interior is exquisitely done (yes they did have a peak), the table settings have a comfort loaded touch of their own. And you need to keep in mind, that no matter what the occasion, Tuscany is available for social events that range from elegant to casual.